2009 Marked our 10 year anniversary of providing the highest quality beeswax and other fine candles on the market. It has been an honor to bring such wonderful candles to such wonderful customers around the world! Experience a truly one of a kind candle! Introducing the newest item to our collection of fine candles, the 12” 100% Beeswax Feather Twist with Gold Edge in Blue. 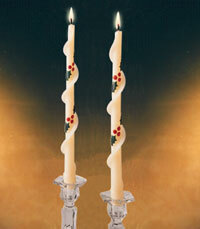 These unique candles were crafted for Candle-Styx.com and are NOT available for general distribution to the public. We commissioned Dadant & Sons to create these truly one of a kind candles for our anniversary. Own yourself one of these truly spectacular candles while supplies last. Click on the picture to order today! Introducing our 5” – 100% Beeswax Pine Cones! These exciting unscented candles will bring out the Holiday Season on any dinner table or fireplace mantel. These Pine Cones have the beautiful light fragrance of natural beeswax. Simple Elegance! 4” tall – 100% Beeswax Pillars. These lovely solid pillars will grace any table year round. These very difficult to find candles are unscented, except for the light fragrance of natural beeswax. 100% Beeswax 5" x 6" Rolled Pillar - This very large hand rolled pillar is very impressive by it's sheer size. This candle is more than just a conversational piece, when lit, it burns very evenly when kept lit for a couple hours. This is an excellent candle to make a statement to any table. Shop our fine line of Beeswax candles with confidence knowing you are ordering not only the most innovative, but the finest quality candles on the market today. Compare our products with the competition for price and quality, and you will know you have purchased the finest candles available. Shop confidently knowing your order goes through the most secure Shopping Cart on the Internet. The allure of candles has captivated civilization for thousands of years. We specialize in the finest candles available. Our lines of Christmas, Decorative, Traditional, Church, and Wedding candles are found in a wide variety of colors and styles. More info on candle shown. 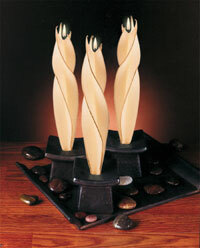 Our fine line of Beeswax candles cannot be touched by anyone else on the market. Beeswax is the cleanest burning candle available. They are smokeless, virtually dripless, and very slow burning. The natural honey scent can be enjoyed with every candle. All of our beeswax products are proudly manufactured by Dadant & Sons. They have been in the candle making business for over 135 years. More info on candle shown. candle holders. Candles should always be burned with adult supervision. For shipping and handling costs please click here. When purchasing from this site you agree that you have read and agree to our Disclaimer. Copyright © 2003 Dionysus, Inc.